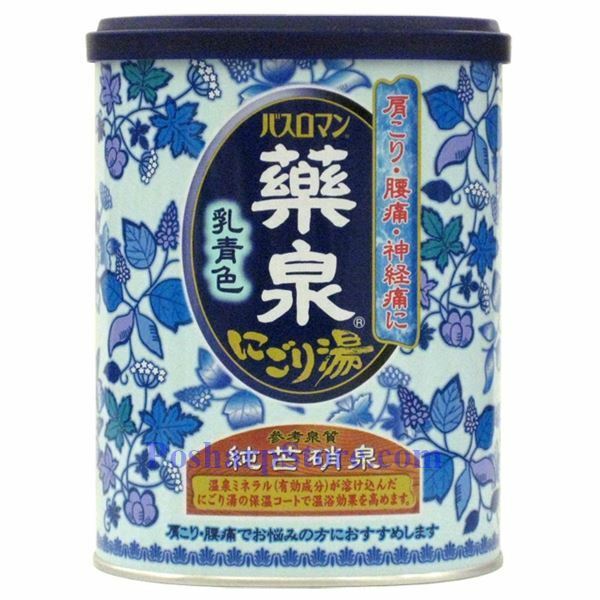 This milky bath salt is formulated to have similar benefits to Japanese traditional muddy hot springs. 90% of its ingredients are hot spring minerals and nature remedies. The muddy water keeps body warm for a long time. Helps to ease physical fatigue, shoulder ache, back ache, cold, rheumatism, and other skin problems. Water color: Milky blue color. Use exclusively for bathing purposes. Does not contain sulfur which may cause damages to a bath tub. Consult a doctore before use if you have skin problems or any physical concerns. Discontinue use and consult physician if skin irritation occurs after bathing. Keep out of reach of children. Not edible. If you accidently swallow the products, we suggest you drink a generous quantity of water and see your physician as soon as possible. Store the product in a dry location. Moisture can cause discoloration and degrade the fragrance of the product. Pour 30g of powder into bath water (200ml) and stir well. Fill to inside line of the plastic lid to measure 15g.